Everyone is different when it comes to the dosing that they need, although I have my standard dosings. The amount that you need depends upon the area you have injected, for instance, larger muscles groups, like the frown, need more product than for instance than the eyes or the upper lip, where there is little muscle bulk. Other factors will be you age, your skin type and amount of lines in the area you want to treat. On the whole, I prefer to start small and build up gradually over time with the dose, as desired. If you inject too little then your treatment will not last for long (it should last on average at least 3 months) or you won’t get a good treatment result and will still have too many lines. If you inject too much then you get the much feared “frozen” look. Years ago when I first started injecting and was experimenting on dosing regimes I over-injected around my eyes. I was horrified when I saw the photos. It didn’t look like me at all and my smile looked so fake. I would never want to do this to any of my patients. 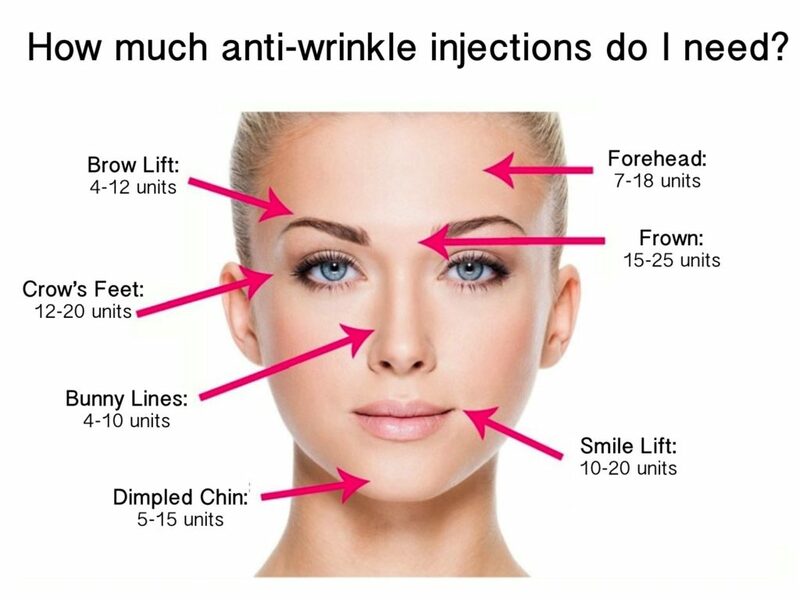 What brands of anti-wrinkle injection are there? There are 3 brands of anti-wrinkle injections available in Australia , but for legal reasons, doctors are not allowed to say what they are. So I’ll call them Brand B, Brand D and Brand X. I have worked with all 3 brands, however, I most commonly use Brand D. It is slightly cheaper to buy from the manufacturer, hence my prices for it are cheaper. Brand B is the most expensive and Brand X, to my knowledge is used the least. I find that they all work equally well. Brand D works with 3 days, Brands B & X work after 5 days, and hence why I use more of it. That said, some of my patients have a preference for one Brand over another and I’m always happy to accommodate.